Your daily objectives will only count if you already have this quest, if you grab the quest after doing several (like I did) you won't get credit for them. This seems to be quite buggy. Several times I have progressed an area from 0% to 100%, received the reward for the objective, but not had the quest recognise it at all. Edit: 2015-06-27 Hotfixes say "Pressing the Attack: Completing the one-time chapter versions of each bonus objective related to this quest should now be awarding quest credit." so I guess that is what the issue was. When starting dailies at Tanaan always do the MAP quest first then return it before doing anything else. It opens up more quests which some times can be done in the same place. For example i had the Renverser la Horde de Fer quest and took from the map the Assaut sur le temple de Sha’naar quest. I did The temple of sha'naar quest map and returned and ended up getting the next ones which were Intensifier l’attaque and Gangrené, délivré. 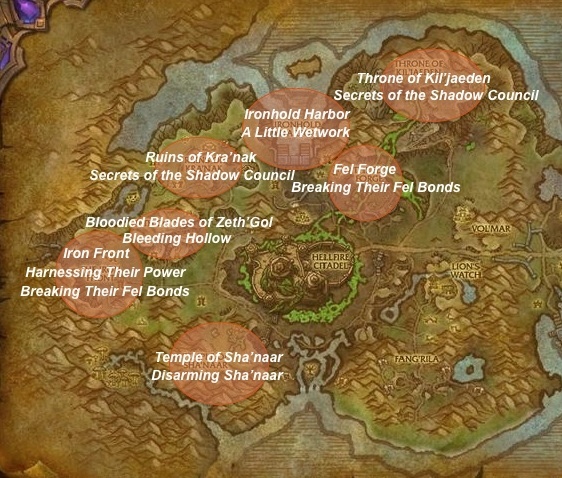 This means i could achieve three quests in one location (The iron front) for fel blood, orc kills and bonus objective. Had i not gone back i would have to had kill the orcs for nothing. I noticed yesterday that this quest was available after I'd completed the objective for the map daily, but *before* I turned that daily in. I suspect completing an objective is the trigger, not completing the quest. This quest now awards 150 garrison resources in addition to the apexis crystals. I did not see this change in today's official log of hotfixes. This is just a guess, but areas that are an actual daily quest will *not* count as bonus objective areas. Started the day w/ the quest at 1/2 for objective areas. I did the Sha'tari quest area since it was the map option. I completed it and got credit for completing the map quest. However, it did not also count for the 2/2 on the Pressing the Attack quest. TL;DR - don't assume that you'll get a two-fer by combining the Daily map quest with this one. EDIT: I will check back tomorrow to confirm if this is the case. If you can spare the time on a particular day, do another two bonus areas but only up to 90%. The next time you take this quest you can resume the 90% areas and it would only take a few minutes to finish. This quest is still bugging out and not giving credit for some zones. For me, Iron Front has been bugged for several days in a row now, and completing the bonus zone doesn't give quest credit. I think the problem relates to if you picked up that zone as a previous day's daily from the map but never completed it - the quest resets overnight but is still stuck in your log as a phantom quest. You should see when you first go to the zone that two separate progress bars appear, but then the normal one (with the apexis bonus on completion) disappears, and completing the zone doesn't count towards Pressing The Attack but towards the non-existent daily stuck in your quest log. Unfortunately I don't know how to fix this, I suspect the only way to get it sorted is to wait until that zone is up as one of the two map dailies, pick it up again and complete it properly. And try not to leave incomplete dailies in your quest log at the end of the day. Terminez deux zones d’objectif bonus dans la Jungle de Tanaan. Les serviteurs de Gul’dan ont décampé, commandant ! Nous devrions poursuivre l’offensive dès maintenant et donner l’assaut sur ses autres bastions, si vous vous en sentez capable. Voilà une merveilleuse nouvelle, commandant. La citadelle macabre de Gul’dan sera bientôt entièrement encerclée !